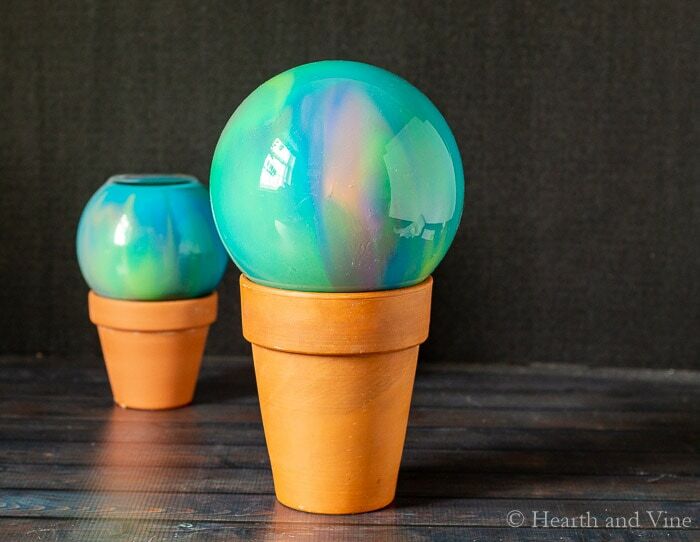 These gazing balls, perfect for gift giving, are super easy to create and can be used in the garden or as a tabletop decoration. 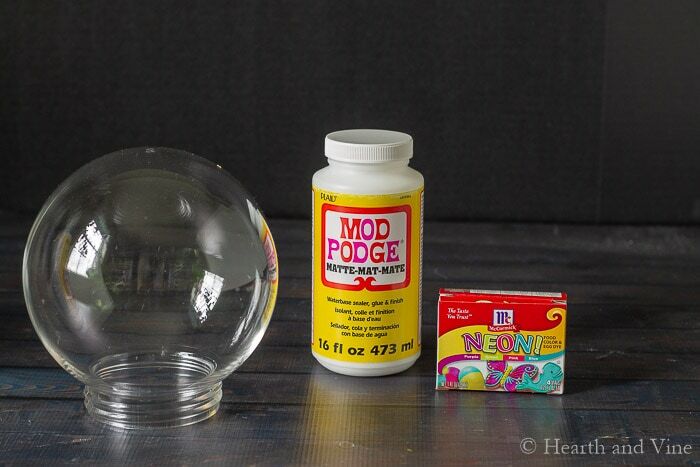 Today I’m going to show you how to make a simple gazing ball with Mod Podge, neon food coloring, a clear plastic light fixture, and a dollar store vase. 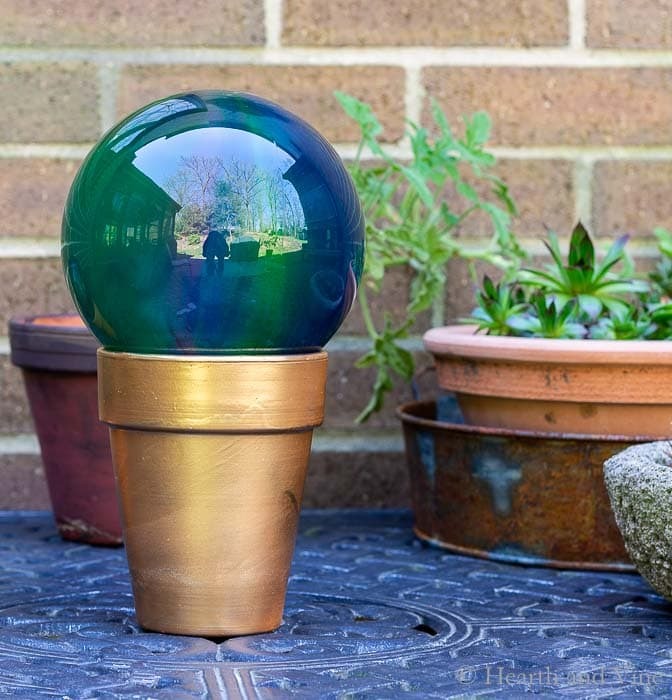 Gazing balls were all the rage when I first started gardening, and when I started blogging I noticed a ton of DIY gazing balls. You may have seen them too. You know the ones made from bowling balls or light fixtures with marbles or gems glued all over. They are all so beautiful. Update: I’ve had the two gazing balls on my uncovered porch for a few months and they still looked great. However, when I placed them in the garden the smaller glass vase did start to melt a little and parts of it were white. The larger plastic version seems okay but maybe a little faded. I suggest that you place it in a shady part of your garden. 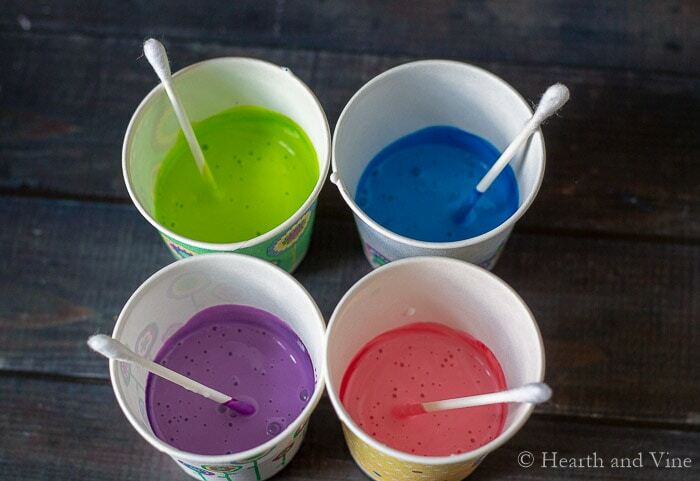 Start by mixing some of the Mod Podge and food coloring together in small cups. I stayed with the four colors that came in the box. However, they also have ratios for mixing even more colors from the original four. Pour a little of each into the bottom of the ball and swirl them around. 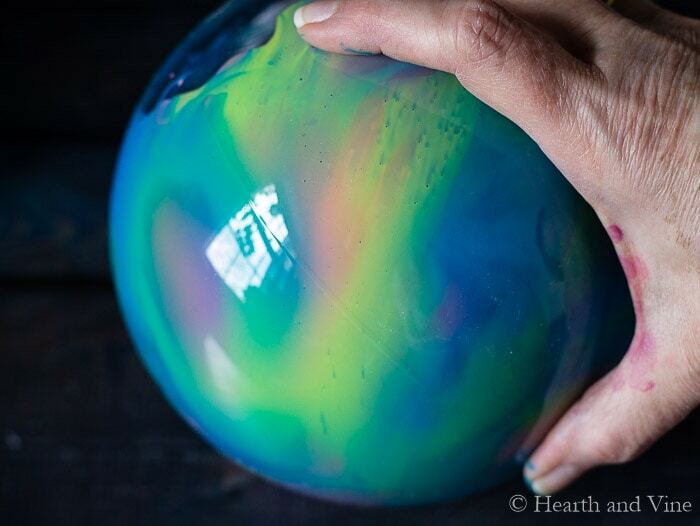 Continue rolling the ball around, allowing the entire ball to be coated with the mixture. Add more of the colored glue mixture if needed. 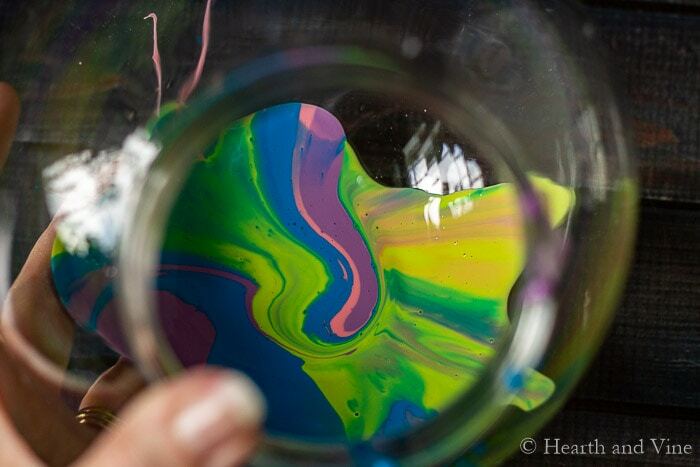 Once it is coated place it on some paper and allow excess paint to drip out onto the paper. Here’s what they look like while the Mod Podge is still wet. They look so pretty that I’m thinking about trying this with a white base next time. Maybe some white craft paint, or leftover house paint. Here’s what it looked like the next day. This particular one is a little glass vase from the dollar store. It’s cute but has a flat top which is why I decided to buy the vinyl light fixture online for a true ball-like effect. They fit nicely on clay pots. My daughter suggested that I spray paint one of them gold. Good idea, huh? Now I need to find the perfect spot in the garden, or maybe I’ll just keep them out as a cool tabletop decoration. P.S. If you enjoy making garden art you may like my post on a Leaf Embossed Fountain. Or, this Sea Glass Lawn Ornament. 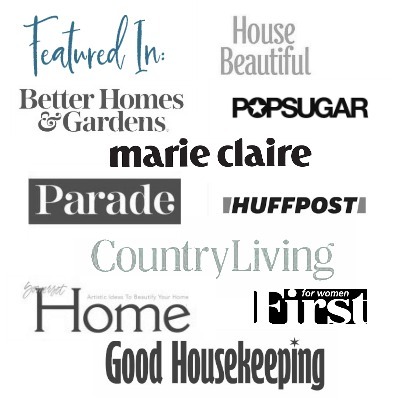 Just of few of many DIY/Projects to enjoy creating. I’m so glad you like it Pixie and I think the glue stick is worth a try. I did mention that the sun seemed to fade and almost melt the little glass one. However, I had them on a shady porch for most of the summer and they were fine. I hope to try it again with craft paints to see if that’s a more sustainable medium. Donna, if you mean the amount of the the Mod Podge, you actually need very little. The color portions is really up to you. I just used a little bit of each color and started swirling. I was very excited about making my gazing ball, but unfortunately, it did not work out for me. When trying to purchase the neon coloring, it seems that they only sell ‘gel’ coloring these days, so the associate assured me that I should dilute first to make sure that it mixed with the modgepodge correctly, this mixture ended up way too runny and after putting into the fish bowl, it more or less came out over the next couple hours. Second attempt seemed to work better, the consistency was certainly better and thicker, however, after four days of having upside down on my kitchen countertop, it seemed not to want to dry out? I kept changing the paper underneath for new, and while I did this, I turned the fish bowl up the correct way, but it seemed that when I did this, the modgepodge seemed to want to run back into the bowl, so for some reason, definitely not wanting to dry, and if the reason behind this was because there was too much modgepodge in the fish bowl in the first place, then I would have thought when it was turned upside down for four days, that this would have come out enough that we would end up drying out? Eventually I decided to put out on my front porch on top of a garden pot. I thought that maybe the upside down pot with its holes in was what was needed, the air could then circulate into the fish bowl and it would dry out this way. After a couple days, it seemed that the fish bowl did clear, but that was only because the modgepodge almost melted in its entirety and all came out? The weather outside was a little warmer than my kitchen, which might have been a factor, but if ultimately it was going to go into the garden anyway, this would have happened at some point anyway. Any pointers on what I might have done wrong would be greatly appreciated. I have so longed for a gazing ball and making one yourself is way more exciting than to go and buy like most people. Thank you. Sorry you are having so much trouble Jill. I’ve had my gazing balls on the patio table and they are doing fine. I’ll move them to the garden to see if that makes any difference. In the meantime, one thought I had was to use regular paints. They even sell patio paint in the craft store that is supposed to be good for outside. 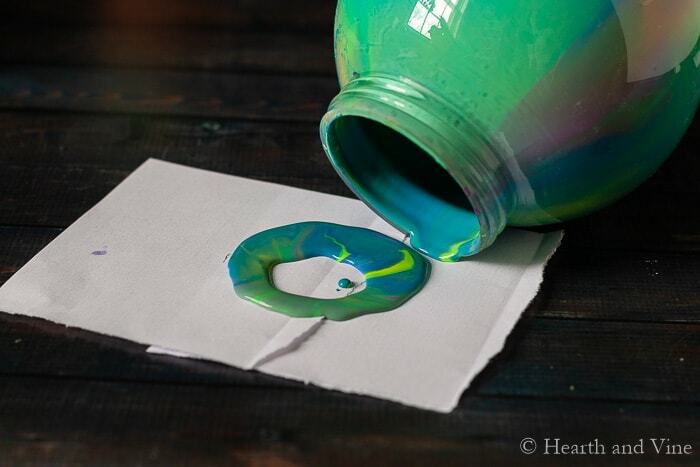 I have seen people make vases using paint with this swirling method. Maybe it would work better for you. They are probably used indoors, but think of all the painted rocks you see. They are made for the outdoors. That’s great to hear Andrea. Thanks for sharing! Love This! It’s just what I have been looking for. How has the modge podge held up to the summer heat outside? Sandy, so far they have held up well. However, I’ve had them on our patio which does get sun but not as much as the garden. I’ll try moving them to see how they do. I’m just going to admit that I have never heard of gazing balls, Patti! 😀 What a cute project though! I think I may have to do this with my kiddos this summer. Looks like a fun way to keep them entertained and productive for a while! I love them! I wanna make a bunch!! I think our humidity would keep the glue gooey, so I’m thinking about closing it up. Maybe glue on a re-purposed plastic lid with silicone or waterproof glue. Would this cause any issues I’m not considering? I’m so glad you like it Diana. You should probably make a test sample first before investing in several. You could try shopping at your local thrift store to see if you can find any fixtures to play with. You could also check online with the manufacturer (Mod Podge) to see if they have any suggestions. Let me know how it goes. So lovely! What a perfectly easy and beautiful DIY, Patti! 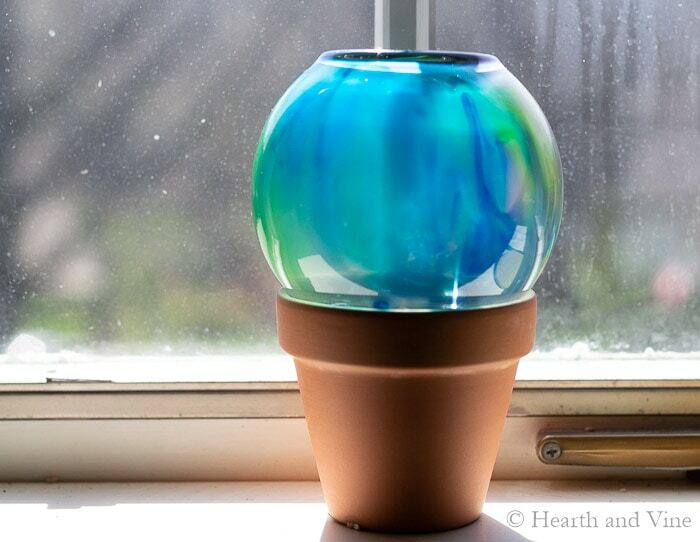 You could actually put a smaller vase in the one, and it would make a lovely ‘gazing ball planter’! Thanks Julie. That’s an interesting idea! What a clever idea, Patti – you could also repurpose light fixtures from thrift stores, though they’d mostly be glass. Love this! To distract from the flat area I would mount a small bird, bunny or other animal, either painted plastic or ceramic. I think that could look adorable! Thanks for the gazing ball ideas. Can’t wait to try this out…. That is a genius idea! I have the perfect little bird for this. Thanks for sharing. What a beautiful result! Perfect garden art project. That gold pot! Great ideas for pretty affordable garden art. Bet it will look lovely on a patio or tucked into foilage. Thanks Diane. I love your foliage idea, and I’m definitely going to try that soon. Patti, these turned out so nice. I love the swirling effect. So pretty and easy to do too. For lights maybe a small string of led battery powered lights that don’t get hot? I wonder what they would look like with a string of lights in them or possibly some kind of candle light……. That’s a fun idea Linda. I’d worry about the heat but maybe one of those electric tea light candles would work. It would be pretty at night.